A team of Dutch and German scientists decoded the inner dynamics of an important model system of organic chemistry. 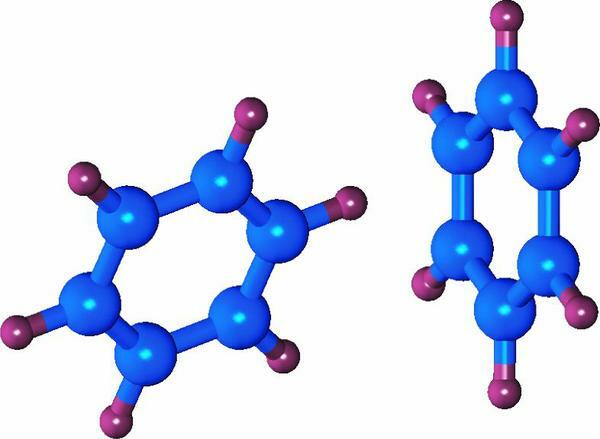 The investigation of the benzene dimer solves a 20-year old mystery, reported the group headed by Melanie Schnell from the Hamburg Center for Free-Electron Laser Science (CFEL). Her study was selected as cover story of the scientific journal “Angewandte Chemie International Edition”and categorised as “very important paper”(VIP) by the evaluators and publishers. CFEL is a joint enterprise from DESY, the Max Planck Society and the University of Hamburg. Two benzene rings form a dimer. Benzene is the most basic so-called aromatic compound. It consists of a ring of six carbon atoms with one hydrogen atom attached to each carbon atom. The benzene double molecule, the so-called dimer, is the prototype for the investigation of a complete class of chemical bonds, the van der Waals bond. This is a relatively weak bond between molecules which plays an important role in many fields. An illustrative example is geckos which, thanks to the van der Waals force between the very fine hairs on their footpads and the surface, are able to move on the ceiling. In the benzene dimer, both benzene rings attach to each other like a T. One ring forms the cap and one the stem; with the stem being slightly tilted to the border of the cap and not in its centre. In spite of this asymmetric structure, the benzene dimer behaves like a symmetric spin top when investigated with micro waves. This was not understood for a long time. This was also true for the comprehensive substructure which is revealed in the so-called rotational spectrum. With their combination of high-resolution microwave investigations and the theoretical calculations, with Professor Ad van der Avoird from the Radboud University of Nijmegen in the Netherlands in a leading role, the group headed by Schnell was able to demonstrate that the cap rotates almost freely, thus dominating the so-called rotational spectrum of the benzene dimer. The substructure of the spectrum is, among others, due to the cap performing a tilt on the stem. “We were surprised about the fact that also the stem rotates,”said Schnell who is head of an independent Max Planck research group investigating the structure and dynamics of molecules at CFEL. “This way, the 20-year old mystery of the benzene dimer inner dynamics was solved, thus paving the way for future investigations of the structure and dynamics of aromatic molecular complexes with biological relevance,”the scientists report in the scientific journal. Therefore, it is conceivable to use this method also for amino acids with aromatic subunits,”Schnell points out. Apart from Max Planck researcher Schnell, other participants in this investigation were scientists from the Max Planck Society’s Fritz Haber Institute in Berlin, the Radboud University of Nijmegen, the Gottfried Wilhelm Leibniz University Hannover and the Canadian Research Council in Ottawa.